The good news is that a composite deck can be protected just like a wood deck. Using a stain like Defy Composite Sealer that will penetrate the dense composite material is the key. The surface can be cleaned and treated with a sealer to block out the sun’s damaging UV rays and moisture. When these types of decks are not protected they can gray out, warp, split, and collect mold and mildew. Before staining a composite deck it first has to be cleaned. A good composite deck cleaner Such as the Defy Composite Cleaner should be applied onto the surface. The composite deck can then be pressure washed or scrubbed with a stiff brush to remove any dirt, grime, graying, or mold/mildew. Once the surface is clean it can air dry for a day or so. Be careful not to use just any type of wood sealer on a composite deck. The material is very dense and most stains will not penetrate it very well. A sealer like Defy Composite Sealer is specially formulated to penetrate very dense hardwoods and also works very well on composite decks. It will dive into the surface of the deck and help shield against the sun and unwanted moisture. Maintaining a composite deck is made easy with Defy. Keep your composite surfaces looking like the day they were installed and enjoy them for many years to come. 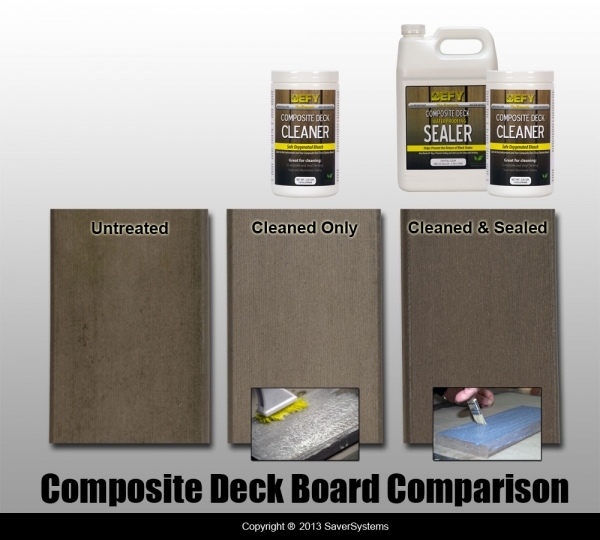 Defy Composite Deck Sealer can be used on all composite wood brands such as: TREX, Fiberon, Azek, TimberTech, etc. It should not be used on solid plastic decking. Last Fall I power washed my composite deck before applying product with a sprayer and deck brush, careful to follow directions. I have some patchy areas of 'white' which is very noticeable on dark brown deck boards. Cause?? How to remedy?? Disappointed in final appearance.. It could be many things. It could be due to the prep, the wood itself, or over application of the sealer. Hard to say what the reason is or how to fix without more details. Do you have a picture? No, you cannot add a grip to this sealer. I used the Deyf composite cleaner and then used your deyf composite clear sealer. I am still seeing white specks on boards and I think I need to strip it down now and used some solid stain to restore to an acceptable look. What do you recommend to strip off the Defy sealer? Use the Defy Stain Stripper. do you sell in 5 gallon containers? How much would be needed for 2250 linear feet? We would need a sq. footage number, not linear. Mo, only gallons for this product. How many square feet per gallon? About 150 Sq feet per gallon. We sell only online from our website. Is the Composite Decking Sealer the same as the Brightner? I was told you could purchase a concentrate brightner to enhance to surface shine. Sounds like the Sealer is the same product. Can you confirm? Hello, not they are not the same, not even close. A wood brightener would not enhance the shine either. 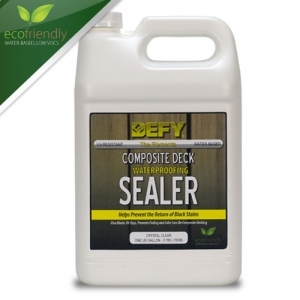 CAN DEFY SEALER BE USED ON TREK CAPPED DECKING? As long as the bottom is composite and porous for the sealer to soak in, then yes. Not all Trex products are composite but some are. For the sealer to work, the decking must be porous. Looking to purchase your product for the composite decking cleaner and sealer in the UK, can you advise any supplier that can help. I am sorry but there are not any dealers in the UK. is your sealer available in Canada? It is not. We ship there from our website. Just finished cleaning our composite deck with Scott's Outdoor Cleaner with Oxy Clean. Looks pretty good. Thought there might be a better solution than scrubbing and power washing every year and found your product. Should we redo the cleaning process with your cleaner before applying the composite sealer or is the Scott's clean ok? Probably will be okay as long as it is clean. Is there a store in New Hampshire that we can purchase this product????? Sorry, but we only sell on our website. My trex deck is flaking, and damaged. I want to put outdoor carpet over it. If I put your sealer on the trex before glueing the carpet down do you think it will be the best product for what I want to do? It will not "fix" your flaking Trex if that is what you mean. Since you are putting carpet on, the only thing the sealer would help with is mold prevention under the carpet. We have read many good reviews on your product and would like to know how can we tell if we have a composite wood deck or a solid plastic deck as I see your product should not be used on a solid plastic deck? We purchased our home 2 years ago, it was built 8 years ago, and we don't have any idea about the deck floors or steps. We just sealed our wooden deck railings and now the deck floors and steps (which are either composite wood or plastic)look so faded and dull. We would like to brighten them up also. We appreciate your help. It is obvious when all plastic as it looks like vinyl and it is not porous. Will Defy sealant work on Geo-Deck composite decking? As long as it is a composite and not 100% plastic, it will work. Hi. where in Winnipeg, Canada can I purchase this composite deck sealer? No dealers in Canada but we can ship to you. I would like to order Defy Sealant for composite decks, but I can't figure out how to do it on-line. Please advise. What is coverage for a gallon of deck sealer? Can't find mention of it in literature. About 150-200 sq. feet per gallon.